Braxton’s Twisted Bit Dortmunder Lager and Dead Blow Tropical Stout also available. Beers include Abita Mardi Gras Bock, Abita Amber, and Purple Haze. Beers include BA Ten Fidy, Ten Fidy, Ten Fidy 2014, Ten Fidy 2013, Dale’s Pale Ale, Priscilla Witbier and Mama’s Little Yella Pils. Beers include Fume, Opera Cream, and Pitter Patter. Beers include Hi 5, Recreational Ale, Hopsecutioner, Mosaic, Moo Hoo, Wake n’ Bake (only keg in the state of Ohio), and Tart Cherry Wake n’ Bake. More information coming in our Friday Tastings and Tappings post. • Cellar Dweller – Five Year Anniversary Saturday from 10:00 am to 11:00 pm. See their Facebook event page for more information. • Milton’s The Prospect Hill Tavern – Bockfest Precipitation Retaliation Happy Hour Friday at 5:30 pm. The snowman will burn at 8:00 pm! • Jungle Jim’s – Friday night tasting from 5:00 to 9:00 pm at both locations. Pints are usually $3. This week, they are pouring beers from Fat Head’s at Fairfield and from Abita at Eastgate. • The Gruff – Collaborative Beer Dinner Saturday at 6:30 pm. Featuring beers from MadTree, Rhinegeist and West Sixth. For more information, see their Facebook event page. • Keystone Hyde Park -Listermann 90s Brunch Saturday from 10:00 am to 2:00 pm. See their Facebook event page for more information. • Mac’s Pizza Mainstrasse – Mardi Gras Braxton Tap Takeover Friday at 5:00 pm. 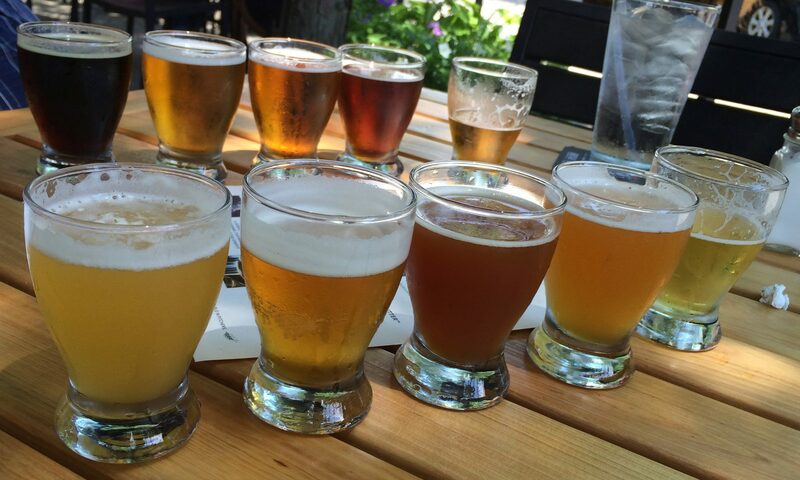 Happy hour from 5-6 includes $1 off beers and buy one get one free appetizers. Beers include Storm, Twisted Bit, Spotlight, Haven, Jumpstart, Tropic Flare, Bluff, Graeter’s Black Raspberry Chocolate Chip Milk Stout, and Dead Blow on Nitro. • Party Town – For Friday Night Flights this week from 5:30-7:00 pm, they’re pouring from Bell’s including Whiskey Barrel Aged Jupiter and Hopslam. It’s $2.00 for the regular sample flights. Only adults age 21 or more are admitted for Friday Night Flights. Limit of one sample per person. No shopping carts in the back room please. • BC’s Bottle Lodge – Two Heads and a Tree Takeover Friday at 6:00 pm. Beers include Madtree Lift, Unhappy Amber, and a surprise keg; Fat Head’s Head Trip, Sunshine Daydream, and Hop Juju; plus Dogfish Head Namaste, Midas Touch, and Olde School. • Cappy’s Wine and Spirits – Local Friday featuring The Woodburn Friday at 5:00 pm. Beers include Hammer Session IPA, Chocolate Mint Imperial Stout, and Berliner Weisse. — Saturday at 3:00 pm, Cappy’s will be hosting a Hi-Wire Launch Party. Beers include Hi-Wire Lager, Bed of Nails Brown Ale, Lo-Pitch Juicy IPA, Hi-Pitch Mosaic IPA, Hi-Wire Gose, Twice as Nice Doppelbock, Strongman Coffee Milk Stout, Enchanter Baltic Porter, Death Defying Spring Ale, 10W-40 Imperial Stout, Pulcinella BA Russian Imperial Stout, Carolina Coastal Black Rye Lager (Collab w/ Holy City Brewing), Oatmeal Brown Ale w/ Honey and Black Currants (Collab w/ Hardywood), Pimm’s Berliner Weisse (Collab w/ NOLA Brewing), Foeder Brett Saison, Hi-Wire’s House English Bitter, Prime Time Session Pale Ale, Sour Blonde Ale, Wild Rye Brett IPA, and a to be determined Small Batch Beer. Beers include Vieielle Artisinal Saison (Batch #20), Surette Provision Saison, Serenata Notturna Belgian Golden Strong Ale, Progenitor American Wild Ale, Colorado Wild Sage Mountain Saison, and Hazy Not Lazy Wheat IPA. Happy Hour pricing ($1 off house beers) all evening long. From Facebook: “Love beer? The you’re going to LOVE our Rhinegeist Beer Dinner on Valentines Day! One ticket purchase includes 3 courses, 4 beers and fun stuff from Rhinegeist brewery! Dessert: Cherry Oatmeal Bread Pudding + Rhinegeist Gramma – Oatmeal Stout. This is their Buffalo Gold beer aged for over three years in a Buffalo Trace barrel. Beers include Fat Heads Hop Juju, Revolution Deth by Cherries, Stone Xocoveza, MadTree Grapefruit Moon, Jackie O’s Shade Abbey, Ommegang Theee Philosophers, Three Floyds Brewing Co. Zombie Dust, North Coast Scrimshaw, Against The Grain plus B Nektar Dry Hopped Cider. The beers for this week’s Pint Night Thursdays are: Main Strasse Covington – Ballast Point, Glendale – Fifty West Coast to Coast IPA and Hyde Park – Fat Head’s Hop Juju. Be sure to buy your tickets in advance. This event frequently sells out, especially the Connoisseur Level tickets. Also, Designated Drivers tickets are not sold at the door. Buy them now. • Christian Moerlein Malt House – Super Firkin Saturday and Pacer Citra Pale Ale Launch Saturday at 2:00 pm. Special brews and infusions from Rhinegeist, MadTree Brewing, Cellar Dweller, Blank Slate Brewing Company, Braxton Brewing Company, Great Lakes Brewing Company, Mt. Carmel Brewing Company , and Listermann Brewing Company as well as Moerlein. Entry to this event is free and sampling tickets can be purchased 5 for $10. • MadTree Brewing – Last Call for 1.0 Saturday starting at 11:00 am. More information available on their Facebook event page. • Country Fresh Farm Market and Wine Depot – Cellar Dweller beer tasting Friday at 3:00 pm. Beers include Ditz hoppy blonde, Blood Orange Uncle Ronnie American pale ale, Jeremiah’s IPA and Eye Opener hazelnut coffee stout. • Jungle Jim’s – Friday night tasting from 5:00 to 9:00 pm at both locations. Pints are usually $3. This week, they are pouring beers from Deschutes at Fairfield and from Victory and Blake’s Ciders at Eastgate. • BC’s Bottle Lodge – Woodburn Brewery Tap Takeover Friday at 6:00 pm. Beers include Emilio!, Han Solo, Hammer Session IPA, Chocolate Cherry Stout and Chocolate Mint Stout. • Braxton Brewing – Graeter’s Black Raspberry Chip Stout Tapping Party today at 5:00 pm. More information on their Facebook event page. • Cappy’s Wine and Spirits – Super Bell’s Weekend continues. See their web site for the long list of beers available. • Ei8ht Ball Brewing – Tonight is Free Bacon Night and they will be pouring Ballast Point Roots to Boots DIPA. Cost is $6 for a ten ounce snifter. • Keystone Hyde Park – Fifty West Takeover today at 6:00 pm. Beers include Bourbon Barrel Aged 10&2 Imperial Stout, 50 West Lager, Doom Pedal White Ale, and One Way Street: Lemon Drop Pale Ale. • Lehr’s Prime Market – Ballast Point pint night today at 5:00 pm. • Listermann’s – Barrel aged Aftermath Madness Saturday at 11:00 am. See their Facebook event page for more information. • Mash Cult Brewing – Rummin’ With the Devil release Saturday at 1:00 pm. More information on their Facebook event page. This week, it’s Three Floyds Floydivision #4. The cost is $5 for a sixteen ounce pint. This is the second of the collaboration beers made with Cincy Beer Festivals. “Brewed in celebration of Cincy Beerfest’s 10th Anniversary, this Red Belgian Style Wheat Ale is a delight, offering lime, zest, floral and spicy notes.” AND, with every pint purchase, you’ll get to keep the special Commemorative Pint Glass with the Cincy Winter Beerfest 10th Anniversary and Rhinegeist logos! (while supplies last) Also, for every pint sold (of any beer), $1 will be donated to Adore-A-Bull Rescue, a nonprofit dedicated to the rescue and rehabilitation of pitbulls. You’ll get to try Beta 1.0, Beta 2.0 and Beta 4.0 side-by-side plus one more TBA IPA. Both MadTree and Rheingeist brewed special beers for this kickoff of Habits’ Annual Craft Beer Series. Beers include Old Man Winter Old Ale (draft), Krampus Imperial Helles Lager, Tangier Session IPA, Imperial Ginger Beer, and Creme Brulee Imperial Milk Stout. Beers include Beta 4.0 Experimental IPA, Spotlight White IPA, Big Cis Czech Pilsner and Blown Gasket Robust Porter. Beers include Gumballhead, Robert the Bruce, Floydivision numbers 2,3 & 4 along with Zombie Dust. Beers include Kentucky Breakfast Stout and more. The beers for this week’s Pint Night Thursdays are: Main Strasse Covington – Dogfish Head World Wide Stout, Glendale – Southern Tier Creme Brulee and Hyde Park – MadTree Rubus Cacao. Beers include Coffee Brown, Nut Brown, Hibiscus Blue, Imperial IPA, Amber Ale, and Springtime. See their web site for more information and to purchase tickets. Featuring No Rules Vietnamese Porter plus more. Guest bartenders from Brink Brewing picked the beers to be featured which include The Woodburn Brewery Steinpils, Nine Giant Brewing New Sensation Australian Sparkling Ale, Listermann Brewing Company Sabotage East Coast IPA, Blank Slate Brewing Company Opera Cream Stout and two more to be decided. Stuff is Listermann’s collaboration beer with Hoppin’ Frog. Beers available for the release include BA Stuff, Stuff, Stuff Nitro, BA German Cake Aftermath and possibly one or two more. They will be releasing the first 5 of 7 total cocktail variants of Thoroughbred. The bottles will retail for $15.99 plus tax and the 5 variants are: The Deveraux – Lemon zest and elderflowers; Corpse Reviver – Juniper berries, lemon zest, orange zest and grape must; King Cake Old Fashioned – Pecans, walnuts, cinnamon and vanilla beans; Kentucky Mule – Lime and ginger; and Mint Julep – Spearmint and vanilla beans. Due to the holiday weekend, there will not be a Tastings and Tappings post on Friday this week. This time, beers are competing for the best barrel aged brew. This month, it’s their Schwarzbier (Black Lager). Beers include Alpha King, Gumball Head, Robert The Bruce, Space Station Middle Finger, Blot out the Sun, Floy Division #2, Floy Division #3, Permanent Funeral and Zombie Dust. Cost is $10 for 5 four ounce pours. The beers for this week’s Pint Night Thursdays are: Main Strasse Covington – Bell’s Winter White, Glendale – West Sixth Cocoa Porter and Hyde Park – Lexington Brew Breaking the Law. Featuring Dogfish Head beers. See their Facebook event page for more information. • Arthur’s Cafe – All Local Fourth Anniversary on Sunday, Oct. 23rd starting at 11:00 am. Featuring beers from Fifty West, Blank Slate, Cellar Dweller, Christian Morelein, MadTree, Mt. Carmel, Rhinegeist, Rivertown, Streetside and more. Beer Barons Ball Saturday, Oct. 22nd at at JACK Casino. Supports the Brewing Heritage Trail. For more information, check out their web site. • Jungle Jim’s – Friday night tasting from 5:00 to 9:00 pm at both locations. Pints are usually $3. This week, they are pouring beers from Fat Head’s Brewing at Fairfield and beers from Mt. Carmel Brewing at Eastgate. • Arnold’s Bar and Grill – Woodburn Brewery Distrubution Launch Party today at 6:00 pm. Three Woodburn beers on tap including Hans Solo Pumpkin Coffee Blonde Ale which was brewed specifically for the launch. • Crafts and Vines – Sunday at 1:00 pm, this new location in Covington will be tapping MadTree’s S’more Gratitude and hosting a S’mores bar with Grateful Grahams. • Ei8ht Ball Brewing – Free bacon Friday at 5:00 pm. • Growler Stop – Warped Wing Tap Takeover Saturday at 4:00 pm. HAPPY GRAND OPENING DAY to THE WOODBURN BREWERY – Ribbon cutting at 3:30 pm today and open to the public at 4:00. Beers include their Pale Ale, Cedar IPA, Pineapple Saison, Chocolate Cherry Stout, Belgian Wit, Altbier, Belgian Quad, Wit’s End Wheat, Steinpils and Lactose Loves Peaches IPA. • Cincinnati Art Museum – Art After Dark: Art + Beer Bash from 5:00-9:00 pm. Held in their Alice Bimel Courtyard, there will be beer tastings from local breweries, live music by The Hot Magnolias (6:30 – 8:30 pm), guided tours of their permanent collection, and food for purchase from Packhouse Meats and their Terrace Café. • Florence Freedom – Freedom Fall Beer Fest Saturday from 5:00-11:00 pm. More information available on their website. • Hebron Brew Haus – Reality Check End Of Summer Party Saturday starting at 7:00 pm. Three Floyds tap takeover including Zombie Dust. • Country Fresh Farm Market and Wine Depot – Brooklyn Beer Tasting today from 4:00-7:00 pm. • Jungle Jim’s – Friday night tasting from 5:00 to 9:00 pm at both locations. Pints are usually $3. This week, they are pouring beers from Rhinegeist at Fairfield and from Three Floyds at Eastgate. • BC’s Bottle Lodge – Homestead Brewing Tap Takeover starting at 6:00 pm tonight. • Braxton Brewing – Oktober Fuel Tapping Party at 5:00 pm today. German fare, German music and a stein hoisting competition. It’s also their monthly Firkin Friday. • Ei8ht Ball Brewing – Tonight is Free Bacon Night and they will be pouring Rhinegeist Saber Tooth Tiger. Cost is $5 for a ten ounce snifter.